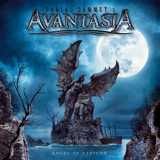 After being a bit disappointed with the first of these two new Avantasia albums, The Wicked Symphony, I came out of it with higher hopes for part two (part three in the Scarecrow trilogy), Angel of Babylon. As is custom for me to do before beginning a review, I first searched for other reviews of the album, and, to my dismay, discovered that AoB is without a doubt the least well received album of the two, according to both critics and fans. Hell, even our veteran reviewer and site founder Chris, who I typically agree with when it comes to power metal, said he would only give the album a score of 77 or so. So when I first listened to this final act of Avantasia (for the time being), I was a bit confused; For me, Angel of Babylon is the superior album of the two; The songs are catchier, more diverse, more memorable, and all-around better than those found on The Wicked Symphony. If you’re looking for something more straightforward out of Avantasia (and, I ask, why would you? ), then you’d definitely enjoy TWS more; if you’re looking for a more varied Sammet creation that’s similar to The Scarecrow, then AoB is the album for you. Angel of Babylon begins in the best possible way with Stargazers; not only is it a great opener because of the sing-along chorus and fast pace, but also because some of the best vocal performances on the album are given here. Tobias sings the verse in intense fashion, Michael Kiske belts out the chorus, and both Bob Catley and Jorn Lande make appearances in the chorus; the latter also assists Sammet in the verse and in the song’s slower paced ending segment. Memorable performances and songs are littered all about Angel of Babylon; Jon Oliva’s creepy performance in the oddball number Death is Just a Feeling is simply unforgettable, and Lande gives us a taste of a mellower variation of his voice in the wonderfully bluesy Alone I Remember. Promised Land, a song that was originally featured on the Lost in Space Pt. II EP, is revised here, and though it lacks the talent of Michael Kiske (mainly for story reasons, I suspect), it still manages to be a highlight of Angel of Babylon thanks to its memorable hooks and yet another incredible performance by Jorn; I am, in case you haven’t realized yet, a huge Jorn Lande fan. He absolutely steals the show every time he opens his mouth, period, end of story. There are also a few straightforward hard rock / power metal songs here, but they don’t dominate Angel of Babylon as they do with The Wicked Symphony; the ones present on this album are the title track, Your Love is Evil, Rat Race, and Down in the Dark. Of these, the title track and Rat Race in particular stand out for being decidedly quick-paced, though the former beats it out because of its sheer bombast and melody quality. But not all is well with this album; some songs just seem unnecessary, such us Symphony of Life, which is little more than an Evanescense knock-off, featuring Japanese female guest vocalist Cloudy Yang giving her most obvious Amy Lee impersonation and sounding annoying in the process. There’s two ballads here, and one is incredibly good, though the other is fairly mediocre; Blowing Out the Flame is by far the weaker of the two, Tobias giving the sappiest performance he can muster, though the end result is unimpressive. The second ballad, Journey to Arcadia, is the last song present, and marks the end of the Scarecrow trilogy; this is a big, bombastic number to be sure, and it’s easily one of the best songs on Angel of Babylon, but as it is the last Avantasia song for perhaps a long while, and it’s a bit disappointing that only Lande and Catley are present. Personally, I would’ve brought together nearly everyone that performed on all three albums to create the pinnacle of multi-vocalist metal music, but it’s still an impressive song all the same. Now that I have talked Angel of Babylon, I would like to sum up not only the album, but also the Scarecrow trilogy is a whole. AoB, in my opinion, is the second best album of the three; it’s not quite as big and diverse as The Scarecrow, yet it is certainly more impressive than the unfortunately straightforward Wicked Symphony. However, with The Scarecrow, the music was so well written that I didn’t care that it was only 10% power metal; It was easy to feel a connection to the story that Tobias was telling, even if I wasn’t sure at the time what exactly the story was. But both The Wicked Symphony and Angel of Babylon have lost the emotional edge of the original album, and while they’re both very good albums in their own right, I couldn’t help but wish that Avantasia was still a power metal project. Like many artists have been doing recently, I expect Tobias to have a change of heart in the future and begin to make power metal again, but until then, these albums will have to suffice. They seem like missed opportunities, to be sure, and they ultimately feel rushed, but they are both solid efforts that I’ll probably listen to again in the near future.